The Estadio Benito Villamarin is the home stadium of La Liga side Real Betis, located in Seville, Spain. The ground first opened in 1929, and has undone two major renovations since in 1982, and in 2000, with the capacity now standing at 52,500. Estadio Benito Villamarín first opened on 17th March 1929 with an inaugural match between Spain and Portugal which saw the hosts humiliate their neighbours with a 5-nil thrashing. Designed by a team of architects, Antonio, González and Cordón who also lent a hand to the 1913 San Mamés, Real Betis became full-time residents on the 16th July 1936 after previously playing matches at both Campo del Patronato and Benito Vllamarín. Originally known as Estadio de Heliópolis, the new stadium was one of the most modern sports facilities in Spain at the time. The name Estadio Benito Villamarín only came into existence in the 1970s to coincide with a series of redevelopments, however it was later changed to Estadio Manuel Ruiz de Lopera in 2010. Lasting 10 years in total, Real Betis reverted back to the old name in 2010 after membership vote after the president had departed. Benito Villamarín has undergone several renovations since opening including restoration in 1948 after sustaining flood damage when the river Guadalquivir’s bank’s burst. The most notable reconstruction came in the years leading up to the 1982 World Cup, which saw Betis’ stadium transform into a large outdoor arena capable of seating 47,500 supporters. Selected as one of fifteen host venues, and one of two in Sevilla along with Ramón Sánchez Pizjuán, Estadio Benito Villamarín hosted two matches in total: Brazil v Scotland (4-1), and Brazil v New Zealand (4-0). 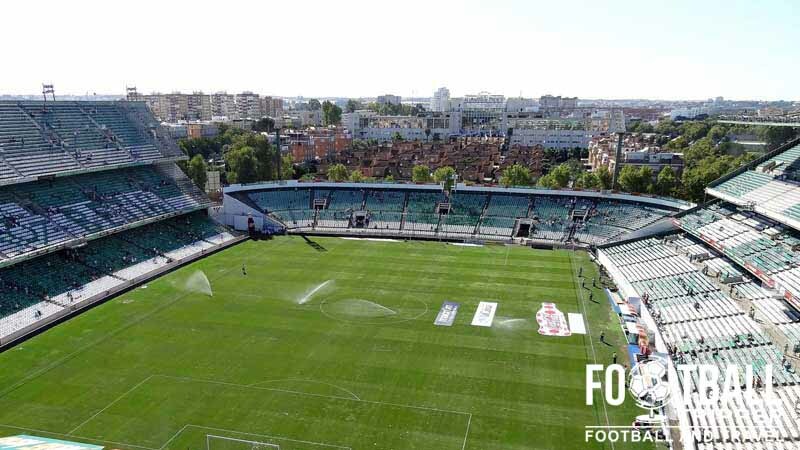 The stadium has also hosted high-level European matches including Champions League group stages during the 2005/2006 season where Betis were drawn against Liverpool, Chelsea and Anderlecht. 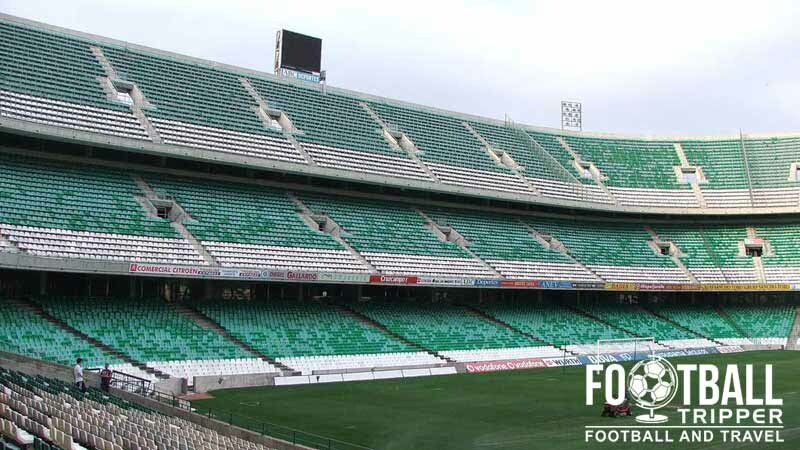 As for the future of Estadio Benito Villamarin there are no current plans to renovate or to relocate Real Betis to new facilities. The stadium was completely rebuilt in the late 1990s as an all-seater to comply with updated UEFA stadium regulations, and thus is actually fairly modern. Estadio Benito Villamarín is comprised of four stands: North, East, South and West. Estadio Benito Villamarín is located in a somewhat quiet part of town with less fancy eating and drinking options such as Restaurante Doña Clara, highly rated Pizzeria al Gusto tapas and the classiest of them all Restaurante Doner Kebab El Turco. Within the larger and more diverse city centre there are a lot restaurants which serve Andalusian cuisine such as tortilla española (potato omelet), patatas bravas (spicy potatoes) and pulpo gallego (Galician octopus). Having opened on the 27th July 2012 according to the site, the stadium shop is the best place to spend your green on green. You can also purchase stuff from the official online Betis store if you can’t be dealing with shopping bags at the time. Contact: +34 954 23 10 51 or Facebook page. Matchdays – up to 5 hours before kick off. Note: As to be expected the tour is closed on bank holidays such as Christmas and New Year’s day as well as Sundays. 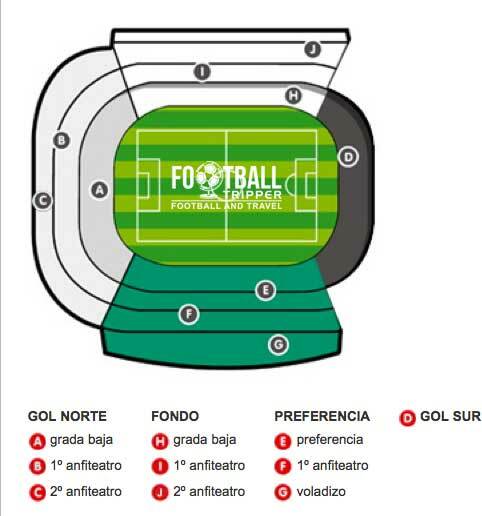 Tickets for Real Betis matches can be purchased by the usual methods such as Online, by phone (+ 34 699 042 130) or most popularly at the box offices/windows at the stadium itself. 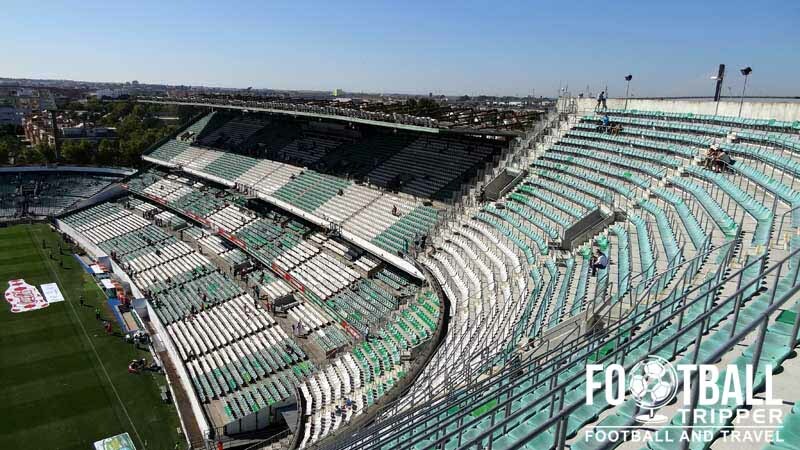 Even though Betis’ matches have high attendances, there’s always a few tickets going spare for most matches with the exception of the Seville Derby although even then you might be ok if you get there early enough. 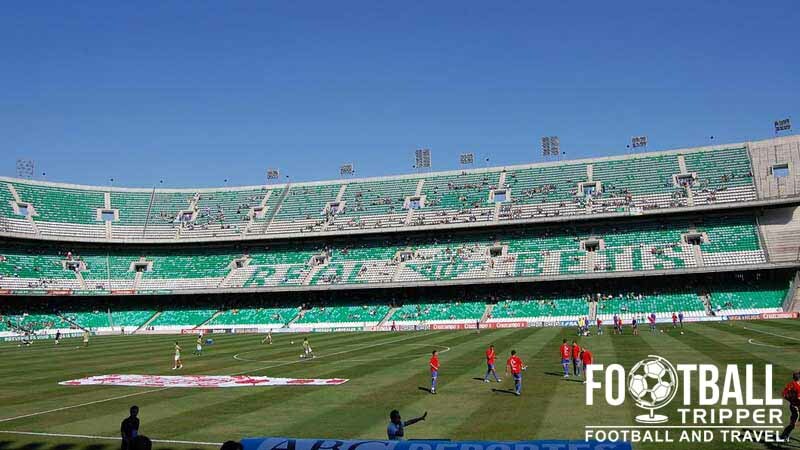 As it is the end of season and I can’t check official prices it’s hard to give an authoritative guide to ticket prices for Betis games but based on an average match and previous prices anywhere between €35.00 – €90.00 would be normal. Of course, this depends on the competition and where you sit, good luck! Estadio Benito Villamarín was built in the Southern part of the city, approximately 3.5km away from what constitutes the “old” city centre. From the city centre the walk to the stadium is easy, all you have to do is follow the long stretch of road which runs besides the canal until you get to the stadium. As Real Betis’ ground is located further south than Sevilla’s Ramón Sánchez Pizjuán you could argue that it is in a better location, at least for driving anyway. All you have to do is look for Exit 8 signposted Sevilla / Avenue La Palmera and follow this until the stadium pops up towards your left. The main train station in Seville is Santa Justa which is centrally placed and around 5km north of Estadio Ramón Sánchez. It’s a bit too far to walk in my professional opinion but the bus services more than make up for it with numerous stops along avenue de Kansas City which runs parallel to the railway tracks on the Southern side. Bus 1 – To Glorieta Plus Ultra from the south. All buses are very frequent on matchdays (No less than 3 an hour) and the above routes take you pretty close to the stadium, with Buses 1, 2 and 6 having their last stop directly at the stadium making them the most foolproof options. Aeropuerto de Sevilla is the main airport for Seville and is approximately 15km North East from the Benito Villamarín stadium. Known as a purveyor of low-cost airlines, Seville Airport has frequent bus services which can take you to Plaza de Arma which is basically the city centre in 50 minutes for €4,00 which makes transferring over to your hotel pretty painless. Of course, there is always a Taxi. The closest hotels to Estadio Benito Villamarín are either Villa De La Palmera on the North corner of the roads which surround the stadium or the much larger Silken Al-Andalus Palace which is pretty cheap with decent reviews. If you want something much more central and closer to the station then I recommend either Ayre Hotel Sevilla, Hotel Abanico, or Hotel Adriano as the wildcard expensive option. Do your own research!